The services menu of the Mac OS X is one of the most underestimated features but it is important because it allows you to perform any action on the current selection for example using your browser to open a URL, reading text, sending mail, etc, and it doesn’t matter which application you are using at that time. The problem with different applications on the computer is that they put their on entries on to the services menu, until the services menu becomes unnecessarily big, and if not controlled it can grow to an extent that it will become unusable, this is just the beginning there are also the keyboard issues. A services menu can become too crowded by services you have never used and probably will never use, this is you need a way to edit your menu and make it less congested and more usable. 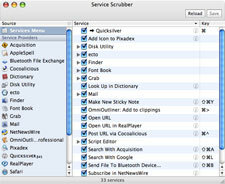 Service scrubber is a software application that assists you in restructuring the services menu, enabling and disabling services and changing service keyboard shortcuts. It shows all the contents of both the services menu and all the service providers. Service Scrubber can be used to disable a service provider totally or maybe if you don’t use a certain program and you don’t want it crowding up the services menu then with Service Scrubber you can switch off the particular services in the service provider. Once Service scrubber has kicked in and done its work you will be amazed at the convenience and usefulness of the services menu. Service Scrubber comes as a 418K download. The only disadvantage of Service Scrubber is that it can not edit signed applications which can be found in the Mac 10.5 Leopard, it also has the setback that you cannot use the control key in shortcuts. If you want your services menu to work the way you always wanted then I would advise you to use Service Scrubber.